Four STEMMY Awards presented on Nov. 8! Milwaukee, WI — Nov. 19, 2018 — STEM Forward is pleased to announce the 2018 STEMMY Award winners. The STEMMYs were established in 2005 to recognize educational institutions, businesses, organizations and individuals whose efforts demonstrate a unique approach or unparalleled commitment to promoting STEM awareness and improving the STEM competency of students. The awards are divided into three categories: individual, business and partnership. “These are the teachers, administrators, professionals and organizations who are making a huge impact on improving STEM competencies for K-12 students in southeastern Wisconsin, and they are playing a vital role in transitioning the Milwaukee area into a technology hub” said Rich Merkel, Executive Director of STEM Forward. Catholic Memorial High School received the STEMMY Award in the education category for hosting its unique STEM Challenge for middle school students across the region. The challenge brings industry professionals, parents, teachers, middle and high school students together as students compete in a rigorous design challenge, encompassing multiple STEM fields. Each middle school team is made up of five students randomly assigned and guided by a Catholic Memorial High School STEM student. The challenge gives students an opportunity to solve a real world problem, collaborate and create a design. Engineers and other STEM professionals from area businesses also spend the day with the students encouraging them, answering questions, and sharing their technical knowledge. These same industry professionals act as judges for the competition. Since the challenge started four years ago student participation has more than doubled with about 20 participating middle schools each year. Catholic Memorial has also seen an increase in the number of incoming freshmen taking STEM classes from 28 to 57 percent, and the percentage of students in STEM classes that are female has risen from 18 to 26 percent. Over the past two years, Discovery World has piloted and expanded its program offerings through extensive collaboration with multiple community and corporate partners. In 2017, with support from Johnson Controls, Discovery World piloted a Repeat Educational Model, which brought 600 students from eight schools onsite during the school day for several hours of STEM focused, project-based activities. The program involved multiple student visits to Discovery World over a six to eight week period and featured a curriculum that built upon itself from week-to-week. This approach lead to greater student mastery of the skills and subject matter. In 2017-18, the program more than tripled to serve almost 2,000 students through new and expanded partnerships with Rockwell Automation, Northwestern Mutual, the Zilber Family Foundation and Johnson Controls. All participating schools were located in Milwaukee with the majority of students coming from low-income homes. According to an evaluation of the program, students grew in their ability to problem solve and overcome obstacles to accomplish tasks. Students also exhibited increased confidence in their ability to perform specific STEM skills. SHARP Literacy was recognized for its Create Art with Code (CAC) program, an innovative effort to teach elementary students coding basics. Through CAC, fourth-grade students at SHARP partnership schools create art using basic computer coding. By using art, dance and movement, students learn about patterns, loops and algorithms. Beyond digital literacy, the process of learning to code promotes problem solving, logic, collaboration and creativity. Development, implementation and evaluation of the program was done in partnership with IT professionals, the UWM’s Girls Who Code Club and the Wisconsin Department of Public Instruction. Many local corporate partners provided expertise and volunteer facilitators. Each student goes through a self-evaluation process and explains how coding could fit into their future, either as a student or a career path. The program’s goals are aligned with mathematics, technology, language arts and national core standards. Implementation and momentum for CAC continues to grow with five additional Milwaukee and Waukesha County schools added last year. Laura Schmidt was honored with the 2018 STEMMY Award in the Individual category. For almost a decade, Laura Schmidt has been a tremendous and tireless advocate for advancing STEM education in southeastern Wisconsin. For the last five years Laura has worked at the center of the New Berlin School District’s successful efforts to infuse STEM learning and college and career readiness throughout the curriculum. Working with the superintendent, administrators and educators, Laura was directly involved in developing many innovative practices, including creating a profile of a “College and Career Ready” graduate, implementing Academic and Career planning with fidelity, starting a district entrepreneurial skills accelerator and numerous innovative employer partnerships. It’s no surprise that over the last five years the New Berlin Schools have become a recognized model for excellence in college and career readiness. In addition, New Berlin’s high schools, Eisenhower and West, are now both regularly ranked among the very best in the state. 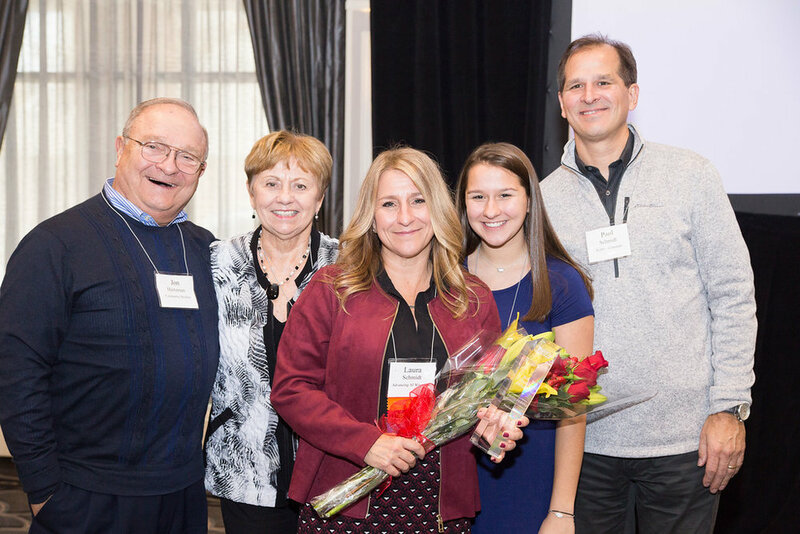 The 2018 STEMMY Award recipients were honored at the 15th Annual sySTEMnow Conference at the Italian Community Center in Milwaukee on Nov. 8, 2018. STEM Forward is a 501(c)(3) nonprofit and metro Milwaukee’s leading STEM education and outreach provider. STEM Forward’s programs and events inspire local youth to pursue STEM careers and provide a pipeline of talent to businesses in southeastern Wisconsin.